Khashee Raheem, right, and Grant Mullins taking part in Central OAC's Art Ministry. Quiet music plays in this classroom in the basement of Central Presbyterian Church in downtown Atlanta. Art is taped to walls and tacked to cork boards. A big table in the center of the room almost overflows with art supplies. A handful of people sit, quietly absorbed in their own projects — drawing, constructing a sculpture out of cardboard. It looks like any other art workshop in a recreation center, except those around the table are grown men and they happen to be homeless. This is the Central Outreach and Advocacy Center, or Central OAC, and this is their Art Ministry. Mullins is working on a pencil drawing – a portrait of a woman – with fine detailing around the eyes and mouth. At the other end of the table, a man named Johnny Binns is carefully snipping at a sculpture of a sport shoe made from cardboard and plastic. He introduces himself as artist-entrepreneur-homeless, which hasn’t squashed his ambition here. He shows several designs on paper for the model he now holds in his hands. Close up, it’s apparent that he’s ingeniously fashioned the heel from the bottom of a Coke bottle. And making life better, or at least improving the quality of life is part of Central Outreach & Advocacy Center’s mission. 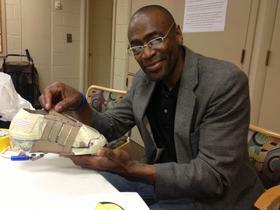 The Center offers a number of services to help people overcome homelessness. That includes helping with documentation — helping people acquire their birth certificate, Social Security card, and other forms of identification. They also offer a Job Readiness program. The Center offers their Art Ministry twice a week, and it helps fulfill a different —though no less important—kind of need. The Arts Ministry has two volunteers, Mark Smith and Zindi Tate. 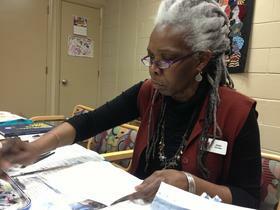 Tate has been volunteering as art teacher at the Center for close to five years now. Most of the participants sang her praises, including Khashee Raheem, a quiet man in a stocking cap. Raheem originally came to Central OAC to get his ID and have somewhere for his mail to be delivered. According to Parker, Central OAC assists about 5,000 individuals per year, including – according to their statistics – over 400 veterans and over 500 children. That’s a lot of “good mornings.” But their mission doesn’t rely solely on simple human kindness or on helping people find work—they also deal in public policy advocacy. “We sit right in the middle of areas where laws or other things are being made that either directly or indirectly effect the people we serve,” Parker says. And she means literally right in the middle, since their location underneath Central Presbyterian puts them across the street from the state capitol and steps away from Atlanta City Hall and the Fulton County government. Another way they’re getting into City Hall is actually through the Art Ministry. Some of the work produced by Central OAC’s guests will be displayed there in late May. Parker says she’s excited to get the work in front of some of the people making potentially life-altering decisions for Central’s guests. The exhibit will not only display the work, but also tell the stories of the artists, in order to reinforce that human connection between them and those who may pass by silently on the street. Kimberly Parker keeps a drawing hung on her office wall. It’s a nature scene, given to her by a former guest, who was at the time homeless and addicted to drugs. It’s a drawing of a river, mountains in the distance, and a figure sits on the bank with a fishing line in the water. It was drawn on what looks like black construction paper, so the scene looks like it’s taking place at dusk. And having the space to imagine that way out may be the most important service the Art Ministry provides. Selected works from Central Outreach & Advocacy Center’s Art Ministry will be on display in the atrium of Atlanta City Hall May 25 through May 29.